It’s been one hundred years – minus just a couple of months – since the people of San Francisco got permission from Congress to build a dam on the Tuolomne River in Yosemite National Park, thereby creating a giant reservoir which has been delivering pristine water to millions of Californians ever since. The dam, an engineering marvel even in those days of impressive dams that were popping up all over the country, was named for its chief engineer, Michael O’Shaughnessy, and still belongs to the City of San Francisco. The reservoir stores river water plus equally pristine snow melt from the surrounding mountains. It then delivers this bounty to millions of Californians, summer or winter, through a gravity system, descending through smaller dams and reservoirs to pipes and tunnels that swish it merrily along. The downside is that under all these tons of stored water lies the once majestic Hetch Hetchy Valley. Naturalist John Muir, who fought the dam to his death, said the Hetch Hetchy Valley equalled Yosemite Valley in grandeur and wonder. For the past ten years a group of folks who would have been – and still are – on John Muir’s side have been working to restore the valley. 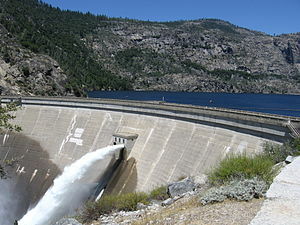 Which means: tear down the dam, find ways to deliver equal supplies of equally pure water to the millions who now turn on their taps for water from Hetch Hetchy. If there are more ferocious wars than water wars, they would be hard to find. At a recent Climate One panel discussion at San Francisco’s Commonwealth Club, battle lines were drawn. Jim Wunderman, President and CEO of the Bay Area Council and Susan Leal, former General Manager of the San Francisco Public Utilities Commission and author of the book Running Out of Water squared off against Mike Marshall, Executive Director and Spreck Rosecranz, Director of Policy for Restore Hetch Hetchy. The battle is currently focused on Proposition F, a San Francisco ballot measure which would require the city to prepare a plan leading toward the eventual demolition (another vote would come a few years later) of the O’Shaughnessy Dam and restoration of the valley John Muir so desperately sought to preserve. Wunderman and Leal, among others, say the $8 million for planning could be better spent somewhere else, the issue has been already studied to extremes and in general Proposition F is a bad idea. Marshall and Rosecranz, among others, say the same good water could be delivered without the O’Shaughnessy Dam, the valley should be restored and anyway, all they’re asking for is a plan. Nobody knows how many years full restoration might take, or exactly how many billions it would cost. One successful financier, a strong Restore Hetch Hetchy supporter, told the crowd the economic benefit of a restored valley would far outweigh the costs; audience members seemed unconvinced. Afterwards, audience members spoke with apprehension about the costs, fondness about their water and wistfulness about the environmental future. “If we just could wave a magic wand and have the valley back for my grandchildren…” one still-undecided voter remarked to me. Everybody says building the dam was a big mistake. …and selling Manhattan to the Dutch was also a mistake. There is no return to the past. If the dam is destroyed SF will pay top dollar (to whom?) for water and power. The power will not be our clean hydroelectric either. Speaking of family values, Camp Mather, SF’s family camp near Hetch Hetchy, the refuge for city families for 3 generations, would be closed to families and turned into a concrete disposal facility – big loss for thousands of families. The Strawberry Festival, bluegrass, twice a year, that takes place at Mather would also be homeless. Families have been going to Strawberry for 30 years. Arlo Guthrie, KD Lang, and legions of country stars who have played under the stars at Camp Mather. By the way, if we could turn back the clock – what date would you choose? Would it apply to cities? to more of the USA? Pre-asphalt roads? Before the European influx? To the time of the glaciers? In that case – rejoice – Hetch Hetchy used to be a glacier lake – and so it has already been restored!! And what would you get for the billions spent, for the historical camp that would be lost? A second valley in Yosemite full of smog-spewing congested traffic. And that is devoutly to be wished. Think not. Think no. No on F. F for FAIL. I’ve read and listened to a lot about this, and your comment is the first I’ve heard about Camp Mather, a rare spot not many of us would want to lose. Personally, I’d rather the dam had not been built, but there it is. And the case for trying to go back in time seems a pretty tough case to make. PS – The Sierra Club, founded by John Muir, is NOT behind the RHH movement. Their silence speaks volumes.